A New York district court judge on Friday denied Apple's request to suspend a ruling that found the company guilty of e-book price fixing while it seeks an appeal. Presiding Judge Denise Cote refused Apple's request to temporarily stay her decision, which would have given the company time to seek an appeal of the penalties laid out by the U.S. Department of Justice, according to in-court reports from The Associated Press. 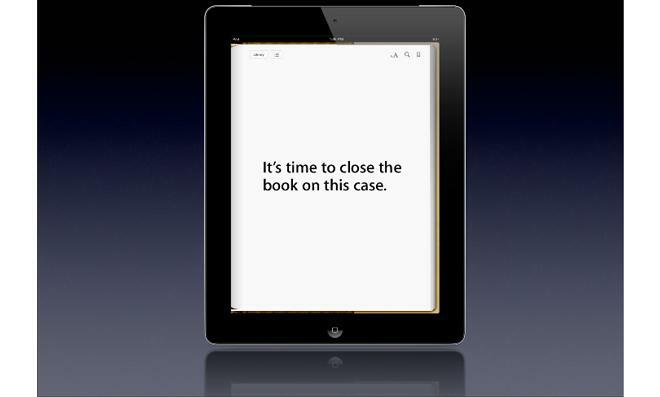 In July, Judge Cote found Apple guilty of colluding with HarperCollins, Hachette, Simon & Schuster, Penguin Group and Macmillan to fix the price of e-books sold through the iBookstore. The antitrust suit was leveled by the Justice Department, which focused on the company's "agency model" agreements that allow publishers to set their own e-book prices under most favored nations clauses. Following the ruling, the DOJ submitted a proposed settlement, which would see Apple terminate existing contracts with the five publishing houses, as well as bar any further agency model deals for five years. In addition, the Justice Department wants to bar Apple from entering similar agency arrangements with providers of "music, movies, television shows or other content that are likely to increase the prices at which Apple's competitors may sell that content." This is seen by some as overreaching, as it would extend the proposal's scope beyond the iBookstore and into the iTunes Store. In a court filing on Wednesday, the publishers, all of which settled before the trial started, challenged the DOJ's suggestion to discontinue existing agreements. They argued that such a clause would punish them more than it does Apple. The comments led the DOJ to issue a court filing on Friday, again accusing Apple of banding together with the cadre of book publishers. Apple has called the proposal a "draconian and punitive intrusion" on its iBookstore and promised to appeal Judge Cote's ruling. That appeal could be in jeopardy with Friday's denial. Update: Concluding Friday's hearing, Judge Cote proposed a new settlement plan that would stagger Apple's deals with the five book publishers to stymie another price fixing arrangement. According to The New York Times, the proposal is a less intensive version of the DOJ's sought guidelines. The parties will meet to discuss Judge Cote's proposal in the coming weeks, while a another court hearing is expected to come later this month.